Comet 215127A Duster 94C Ribbed Cover Puck Kit. Package of 3. 7/8" Hole. 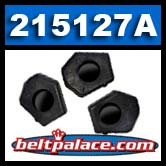 Home > Comet Clutches and Parts > Comet 215127A Ribbed Cover Activator Puck Kit. Sold as set of 3. Comet 215127A Duster 94C Ribbed Cover Activator Puck Kit. Package of 3. 7/8" Hole, 17.3g weight. RIBBED COVER 94C USE ONLY.